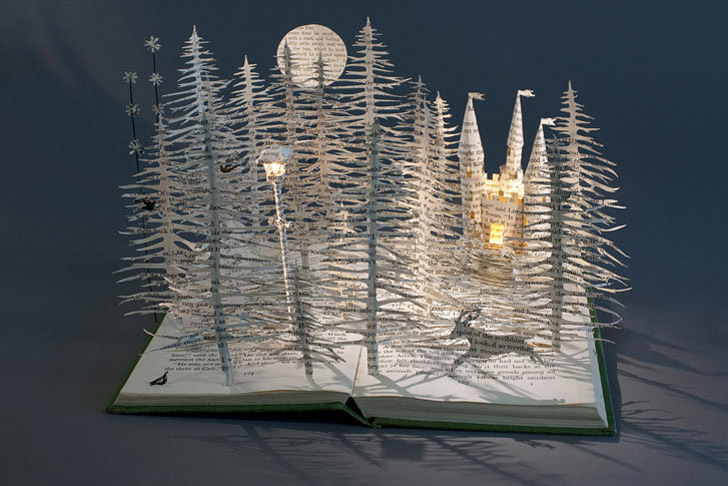 Paper has always been a medium for communication, and British artist Su Blackwell is testing paper's storytelling ability by creating entire landscapes from the pages of books. The inspiration for this incredible paper art came from cutting images from vintage books to make three-dimensional dioramas. Taking the concept a step further, Blackwell transforms the pages of old books into magical snowy landscapes for young female characters in fragile childhood settings. Born in Sheffield, England, Blackwell grew up spending a lot of time on her own and playing in the woods. A textiles graduate from the prestigious Royal College of Art in London, Su now works from her own studio, which is located south of the capital. Inspired by a Chinese paper cutting book she received as a gift, she developed her own personal technique while at university. Blackwell uses the humble and ephemeral qualities of paper to represent feelings of wonder and melancholy. 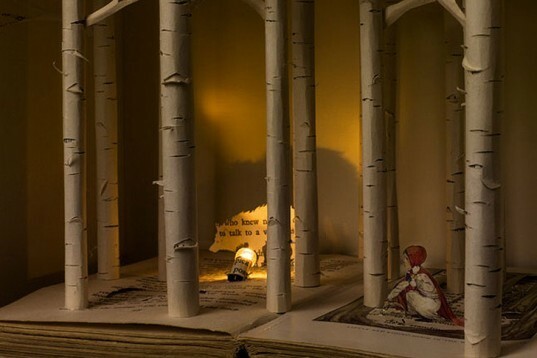 She creates tranquil unique landscapes from cutting up pages of old books. With titles like “The Last Unicorn,” “the Woodcutters Hut” and “The Girl in the Wood,” her work is always inspired by fairy tales and folklore. Su Blackwell uses the humble ephemeral qualities of paper to represent feelings of wonder and melancholy. She creates tranquil unique landscapes from cutting up pages of old books. Dubbed ´The Last Unicorn´, 'the Woodcutters Hut' and 'The Girl in the Wood', her work is always inspired by fairy-tales and folklore. Born in Sheffield, she grows up spending a lot of time on her own and playing in the woods. A textiles graduate from the prestigious Royal College of Art in London, Su now works from her own studio at the south of the capital. Inspired by a Chinese paper-cut book she was given as a gift, he developed her own personal technique while at University.